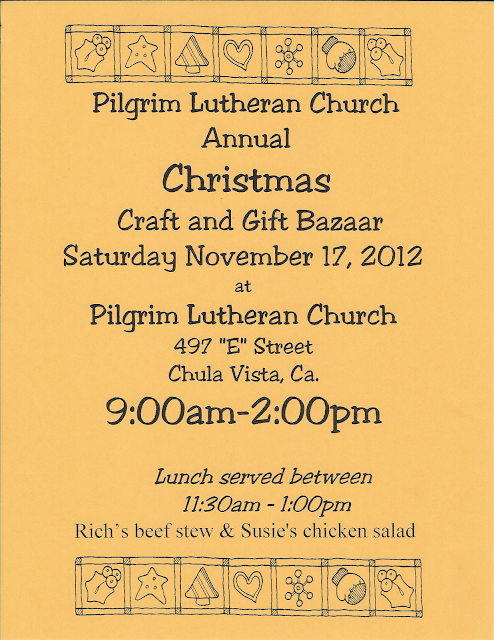 Early Christmas and Holiday shopping begins here at Pilgrim Lutheran Church's Annual Christmas Craft and Gift Bazaar! Make the rounds and see what every booth has to offer! Bring a reusable bag.. or bags, to carry home all your goodies. I always buy one stew and one chicken salad.. I always love what those clever girls at the Alaska Mission for Christ booth are selling.. they are all so crafty and creative! There are also booths that benefit the Youth, and many other groups. Bazaar shopping is so much more fun than mall shopping. This is a fun-filled day for the family, with something for everyone! Homemade goods that will warm your heart. Your friends and family will appreciate the love that went in to their handcrafted presents. How thoughtful! Spread the word, and spread the cheer.. come and join the Christmas fun! click here for the map/directions. Remember to stay for lunch.